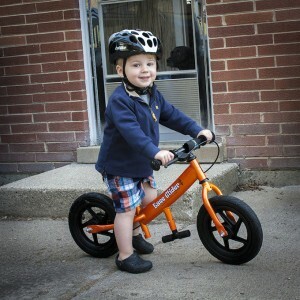 When Caleb was a baby, and got his first YBike Pewi, he had a helmet that I think Sarah got off Amazon at the time. Knowing her ability to research things on the internet, I’m sure it was a good one. And it got some good use, but it seemed like it wasn’t really fitting that well anymore, and seemed like with a new bike that Caleb had, it would be a good idea to get a new helmet. 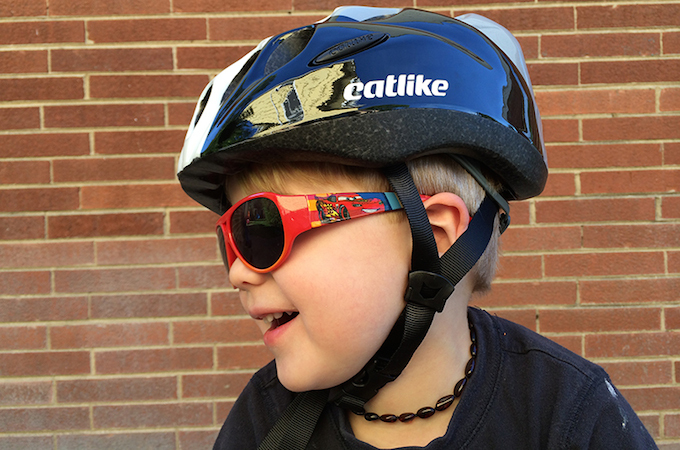 The one we went with was the Catlike Kitten Helmet, and we’ve been really pleased with it. Catlike was founded by Pepe del Ramo (nicknamed “El Gato”), who was a member of the Spanish amateur team and went professional from 1983-1988. 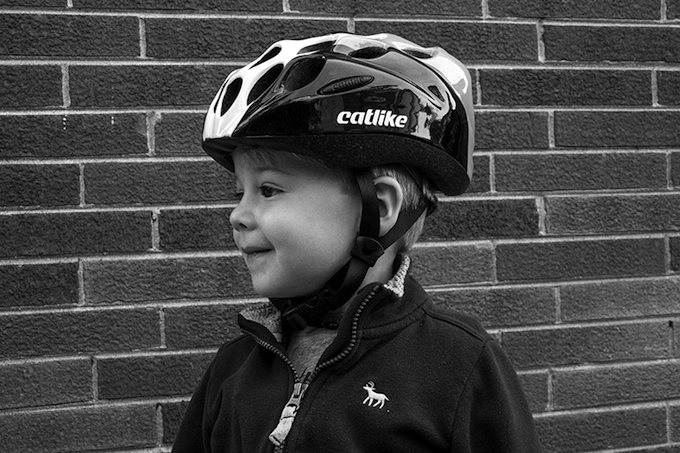 The Kitten helmet is their helmet for toddlers and youngsters just getting started on the bike (although they also make it in Medium for those adults who really like the style). 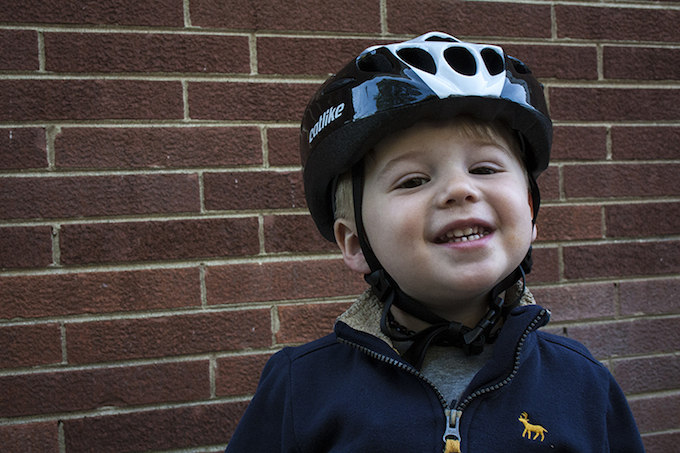 From the first time we put it on Caleb, we could tell it was a significant improvement over his previous helmet. The fit was much better, probably because of all of the adjustment options it has. The strap over the ears and under the chin are easily adjustable…much easier than some of the other helmet straps I’ve tried to use. As you can see in the photo below, one of the best parts is the MPS EXE wheel adjustment on the back of the helmet. One of the biggest problems with Caleb’s old helmet, is that it would constantly slide up on his head, and he’d be riding around with his forehead totally exposed. So, if he were to really bite it on his bike, his old helmet would have been pretty useless. With the MPS EXE wheel adjustment, once you have adjusted the straps to get the right fit, you can get a really snug fit by tightening the wheel. The system has a micrometric wheel adjustment: every “click” tightens or loosens the retention arms by 1mm, so that exact stability assured. 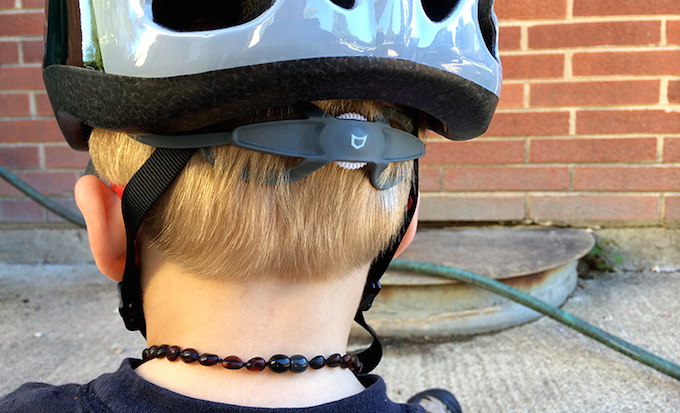 With this snug fit, the helmet doesn’t slide around on his head at all, and so it stays where it needs to, in case he were to have an accident. It also just feels incredibly durable, and while Caleb hasn’t necessarily said anything about the fit or how the design helps him bike any easier…I’m sure all of the vents on the top must have some positive effect. Seeing the quality of the Kitten helmet, I’m definitely going to look into their adult helmets when I need to get myself a new helmet. There really isn’t anything that I think could be improved upon for this helmet for Caleb. I’d say that if you are looking for a good quality helmet for your toddler, as they start riding a bike, this would be a great one to pick up. You can find the Kitten helmet here or you can view all of their products here. One of my sons actually has this helmet, and he loves it. He actually wears it more than he should! I guess that’s the sign of great child protective gear!